SKULL VIDA: Viva la vida! Never before has an HYT creation been so exclusive. Never before has one gone so far in playing with the codes of life and death to celebrate the passing of time and to seize the day. Never before has a timepiece used such materials. 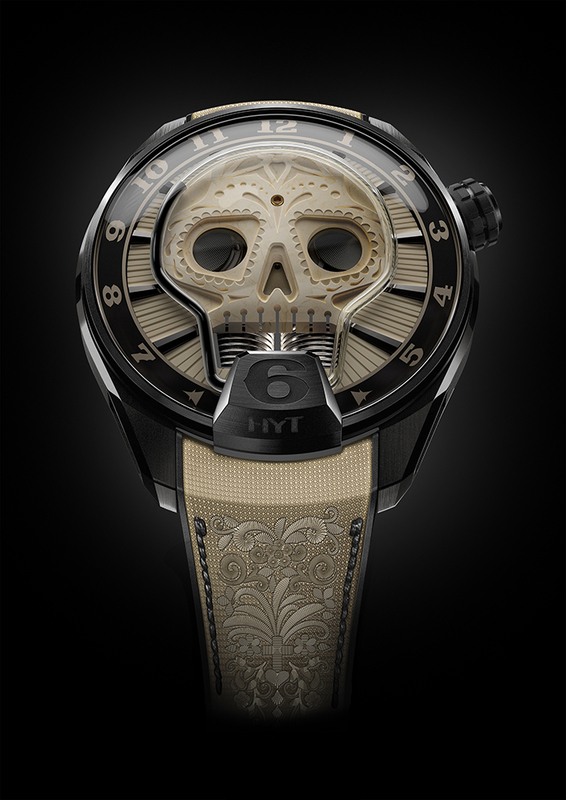 Only five “Skull Vida” pieces will be released in HYT’s most restricted limited edition ever. In fact, rather than a limited edition, we prefer to call them five unique pieces; each one is different as they call on living material in a real watchmaking first: mammoth ivory from many millennia ago. Today, in the Siberian plains, mammoth skeletons are beginning to surface. The majority are exceptionally well-preserved as they have been held captive in ice for 15,000 to 30,000 years. Their bones have been preserved, but are far from inert; they are almost alive, reacting to their exhumation like the living witnesses of a past when they walked alongside Neanderthal man. These remnants of the past come from an extinct species, thereby protecting modern wildlife, which HYT is committed to conserving. The Skull Vida comes in a 51 mm black DLC titanium case with polished, micro-blasted and satin-finished finishes. It is powered by HYT’s exclusive mechanical hand-wound movement which provides a 65-hour power reserve. Its dial is shaped like a skull and is crafted from Siberian mammoth ivory. This living material had to undergo a stabilisation phase over the course of several months. It was sculpted and embedded in the Skull Vida thanks to a series of particularly delicate operations carried out by specially trained artisans. Each dial is completely unique and offers different textures, variations and designs. HYT’s Skull was entirely redesigned to highlight the properties of the mammoth ivory as much as possible. The seconds are displayed in its left eye, the power reserve in its right. The entire artwork is surrounded by an HYT capillary specially folded into the skull shape, in which the separation point of two immiscible liquids indicates the hours. The bezel indicates the result on a black background, with Arabic numerals in a font specially created for the Skull Vida. It is also the first time that HYT has developed a fabric-based strap, which features fine embroidery in an abundant floral theme – a symbol of life!